Céline, our tea expert, has selected a wide range of teas : black tea, green tea, white tea, aromatic tea or flavoured tea, as well as infusions (oolong and rooibos), you will be spoilt for choice! All the most renowned French tea brands are available : Dammann, Comptoir Français du thé, Palais des thés, etc.). Loose leaf tea is currently very popular, and this selection is aimed at bringing tea's gastronomic and cultural wealth to a wider audience. For the perfect tea experience, do not miss our selection of tea infusers and tea accessories! 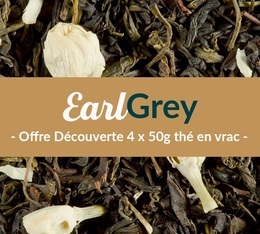 A MaxiCoffee exclusive, this selection pack contains 4x50g airtight sachets of different Earl Grey teas by Dammann Frères and Comptoir Français du Thé. A MaxiCoffee exclusive, this selection pack contains 4x50g airtight sachets of different mint green teas from Dammann Frères and Comptoir Français du Thé. Escape to the Caribbean sun with this 'Pinacolada' tea from Comptoir Français du Thé. This black tea is enriched with pineapple pieces and grated coconut. A real treat! 100g sachet. A MaxiCoffee exclusive, this selection pack contains 4x50g airtight sachets of Breakfast teas by Dammann Frères and Comptoir Français du Thé. Discover the Chaï green tea from Dammann Frères : a cocktail of spices (ginger, cardamom, cinnamon...) giving birth to a fresh and slightly spicy Chai green tea. 100g loose leaf tea. Discover this famous Russian Taste black tea recipe from Comptoir Français du Thé. Certified organic. This black tea with bergamot and citrus will bring freshness to your day. 100g packet. A MaxiCoffee exclusive, this selection pack contains 4x50g airtight sachets of different Russian Taste teas by Dammann Frères and Comptoir Français du Thé. The 'Granola d'Ete' by Dammann Frères is an exquisite blend of Oolong tea with pecans, coconut, cereals and blueberry. A real treat to be enjoyed all day long! 100g sachet. 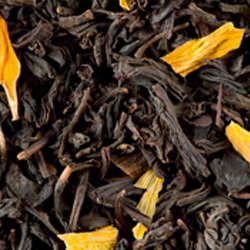 The African Breakfast tea by Dammann Frères is a blend of Assam and Rwanda black teas. 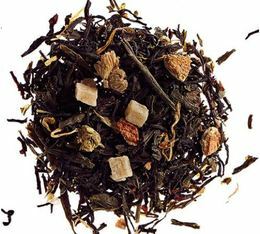 For a powerful cup of tea with earthy, malty notes. Ideal in the mornong. 100g sachet. Yunnan GFOP black tea - 100g loose leaf tea - Dammann Frères. Discover the 'Mélange Place des Vosges' loose leaf black tea by Dammann Frères. A blend of Assam and Darjeeling delivering powerful flavours with sweet subtle notes. 100g sachet. Discover Boston 1773, a blend of natural black teas (Assam, Kenya and Yunnan) from Comptoir Français du Thé. Similar to a traditional Breakfast tea, it is perfect in the morning. 100g packet. Discover the very famous 'Goût Russe' revisited by Dammann Frères to give birth to the 'Grand Goût Russe' black tea. This light tea blends caviar lemon with Calabrian bergamot. 100g loose leaf tea in sachet. Discover this elegant blend of black tea with vanilla, almond and rose petals, creating the sweet and suave 'Flânerie à Paris' tea by Dammann Frères. 100g sachet.